Pink-toe tarantula Avicularia avicularia, from here. The Theraphosidae, tarantulas, are a pantropical group of sometimes very large mygalomorph spiders that inhabit silken burrows or retreats. Characters (from Jocqué & Dippenaar-Schoeman 2007): Medium-sized to very large; eight eyes present in two rows; rastellum absent; labium and endites with numerous cuspules, anterior lobe on endite developed; legs with well-developed scopulae and iridescent claw tufts on leg tarsi and female palpal tarsi, leg tarsi with clavate trichobothria along their length, two or rarely three tarsal claws; four spinnerets present, distal segment of posterior spinnerets digitiform. [B06] Banks, N. 1906. Arachnida from the Bahamas. Bulletin of the American Museum of Natural History 22: 185–189. [BFSJ08] Bertani, R., C. S. Fukushima & P. I. da Silva Júnior. 2008. Mating behavior of Sickius longibulbi (Araneae, Theraphosidae, Ischnocolinae), a spider that lacks spermathecae. Journal of Arachnology 36 (2): 331–335. [B96] Brunet, B. 1996. Spiderwatch: A Guide to Australian Spiders. Reed New Holland: Sydney. [E12] Evenhuis, N. L. 2012. Publication and dating of the Exploration Scientifique de l'Algérie: Histoire Naturelle des Animaux Articulés (1846–1849) by Pierre Hippolyte Lucas. Zootaxa 3448: 1–61. [FF08] Ferretti, N. E., & A. A. Ferrero. 2008. Courtship and mating behavior of Grammostola schulzei (Schmidt 1994) (Araneae, Theraphosidae), a burrowing tarantula from Argentina. Journal of Arachnology 36 (2): 480–483. [FNB08] Fukushima, C. S., R. H. Nagahama & R. Bertani. 2008. 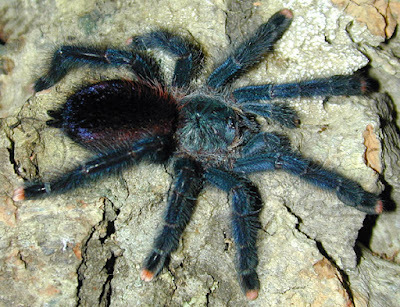 The identity of Mygale brunnipes C. L. Koch 1842 (Araneae, Theraphosidae), with a redescription of the species and the description of a new genus. Journal of Arachnology 36 (2): 402–410. [G11] Guadanucci, J. P. L. 2011. Cladistic analysis and biogeography of the genus Oligoxystre Vellard 1924 (Araneae: Mygalomorphae: Theraphosidae). Journal of Arachnology 39 (2): 320–326. [J-GP07] Jiménez-Guri, E., H. Philippe, B. Okamura & P. W. H. Holland. 2007. Buddenbrockia is a cnidarian worm. Science 317: 116–118. [MU90] Marshall, S. D., & G. W. Uetz. 1990. Incorporation of urticating hairs into silk: a novel defense mechanism in two Neotropical tarantulas (Araneae, Theraphosidae). Journal of Arachnology 18: 143–150. [PCBFF08] Pedroso, D. R., R. L. Cerqueira Baptista & P. S. Fiúza Ferreira. 2008. Trechona rufa (Araneae, Dipluridae): new status, redescription and neotype designation with notes on the genus. Journal of Arachnology 36 (2): 360–367. [P-M02] Pérez-Miles, F. 2002. The occurrence of abdominal urticating hairs during development in Theraphosinae (Araneae, Theraphosidae): phylogenetic implications. Journal of Arachnology 30 (2): 316–320. [SP10] Santos, R., & C. E. Prieto. 2010. Los Assamiidae (Opiliones: Assamiidae) de Río Muni (Guinea Ecuatorial), con la descripción de ocho nuevas especies. Revista de Biologia Tropical 58 (1): 203–243. [T94] Thorell, T. 1894. Förteckning öfver Arachnider från Java och närgränsande öar, insamlade af docenten D:r Carl Aurivillius; jemte beskrifingar å några sydasiatiska och sydamerikanska Spindlar. Bihang till K. Svenska Vetenskaps-Akademiens Handlingar 20 pt 4 (4): 1–63. [V09] Verdcourt, B. (ed.) 2009. Additions to the Wild Fauna and Flora of the Royal Botanic Gardens, Kew. XXVI. Miscellaneous records. Kew Bulletin 64 (1): 183–194. [WS02] Whitmore, C., R. Slotov, T. E. Crouch & A. S. Dippenaar-Schoeman. 2002. Diversity of spiders (Araneae) in a savanna reserve, Northern Province, South Africa. Journal of Arachnology 30 (2): 344–356. [ZZ08] Zhu, M.-S., & R. Zhang. 2008. Revision of the theraphosid spiders from China (Araneae: Mygalomorphae). Journal of Arachnology 36 (2): 425–447.